“I can very much relate to Lewi’s situation with his grandmother not drinking enough water. My Mother had dementia and as she progressed having her drink water was a constant reminder. It’s so important we all stay hydrated, especially older adults. Thank you Lewis for inventing Jelly Drops”. London-based student Lewis Hornby is a grandson on a mission. 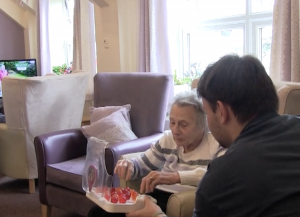 When he noticed that his dementia-afflicted grandmother was having trouble staying hydrated, he came up with Jelly Drops—bite-sized pods of edible water that look just like tasty treats. Each of these colorful “candies” is made up of mostly water, with gelling agents and electrolytes making up just 10% of their composition. Available in a rainbow of colors and presented in packaging reminiscent of a box of chocolates, Jelly Drops are an easy and engaging way to avoid dehydration—a common problem for those suffering from degenerative neurological diseases. “It is very easy for people with dementia to become dehydrated,” he;“Many no longer feel thirst, don’t know how to quench thirst, or don’t have the dexterity to drink.” With this in mind, Hornby set out to find a solution. In addition to seeking advice from psychologists and doctors, he opted to “experience” life with dementia himself through the use of virtual reality tools and a week in a care home. Though Jelly Drops is still in its trial phase, it has already earned Hornby two honors: the Helen Hamlyn Design Award – Snowdon Award for Disability and the Dyson School of Design Engineering DESIRE Award for Social Impact. Clearly, Jelly Drops’ future is looking bright! Please note, I do have any connection with the company. I was just sharing some hopeful news. My Mother was terrible about drinking water and this product would be incredible for those with dementia. We had way too many trips to the hospital for hydration. They do have a Facebook Page which you might follow.